KINGSTON — Asafa Powell was cut down to size this season, losing more races to his arch rivals than he won, but in the midst of that, he failed to set a personal best for the first time in seven seasons. 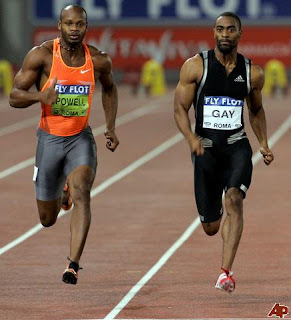 American Tyson Gay had a field day in head-to-head clashes with his Jamaican rival in a 6-1 hammering of the former world record holder, as he squared their all-time match-ups at seven a piece. The sprinters met five times in 2006 and then once there after until the 2009 term where they face each other almost everywhere. Their frequent clashes in a single season was something rare, and Powell said he felt the American was following him to prove a point. "I don’t know why, everywhere I go he (Tyson Gay) was there as if he was trying to prove something," Powell said on his arrival in Jamaica Saturday night. "It seems as if he had something to prove, I did not have anything to prove. I just really wanted to finish the season," added Powell, who earlier this month said he was not expecting to race Gay so many times this year. After finishing behind Gay for three straight races, Powell sneaked a victory in when he used a rocket start to hold off the world silver medallist at the final Golden League meeting of the season in Brussels. But that win did not have time to soak in as Gay returned with three more wins on his way to setting a new American record of 9.69seconds, becoming only the second man to dip under 9.70secs legally. The pair ended their campaigns at the Daegu Pre-Championships Meeting in South Korea last week where Gay chased down Powell to cement his dominance this year, something the Jamaican did not take lightly. "I am definitely tired of losing," the 27-year-old said. "I told myself I am not going to lose anymore and I am going into next year with that mindset. "I don’t want to lose another race, so definitely I am going out there to do greater things than I have ever done before," he added. There were many who themselves were surprised to see Gay still on the circuit, following a groin injury he complained about leading up to the world championships in Berlin last month. Despite the injury, the American produced his best season ever, becoming the second fastest man to cover the 100m dash at the expense of Powell, whose personal best is 9.72s.